Steve Stiles‘ dramatic new artwork is unlike any he’s done before. 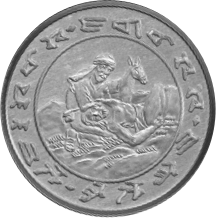 The Samaritan Medal for Peace and Humanitarian Achievement is awarded for distinguished service, the only one of various Samaritan medals actually awarded by the original Samaritan people of Israel. 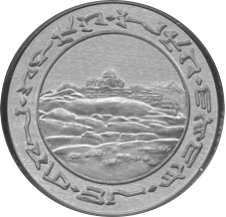 The Medal is made of pure silver, two inches in diameter, with a scene from the parable of the Good Samaritan on the front, and the sacred Mount Gerizim on the reverse. Recipient Shimon Peres, now Israel’s President, was its Foreign Minister when he shared the 1994 Nobel Peace Prize with Yasser Arafat and Prime Minister Yitzhak Rabin. Steve Stiles has worked in virtually every medium, from comic strips to modern abstracts, but this is his first medal design. He is a frequent Hugo Award nominee, and a past winner of the FAAn Award and the Rotsler Award. This entry was posted in Fan Artists and tagged Steve Stiles by Mike Glyer. Bookmark the permalink.